PULLMAN, Wash. – A promising but little-used type of cancer treatment has been markedly improved by researchers at Washington State University by introducing the use of tiny particles of gold and platinum. The new process creates a path to a more targeted, effective treatment that uses less drugs. The research, led by Annie Du, a research professor in the School of Mechanical and Materials Engineering, is detailed in the journal Nanoscale. The researchers used mesoporous core-shell gold-platinum nanoparticles to improve a type of cancer treatment called photodynamic therapy that is less invasive and has fewer side effects than other types of cancer treatment. 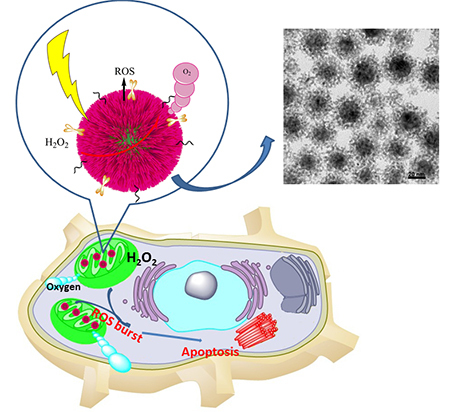 The treatment kills cancer cells by exposing a light-sensitive photosensitizer to light, causing a catalytic reaction that generates reactive oxygen species (ROS). But, the therapy has limited use because the photosensitizer has a short lifespan and the chemicals are hard to diffuse deep into the specific location of cancer cells. Researchers used the nanoparticles to produce more ROS in the reaction, increasing the drug’s cancer killing efficiency. Because they are highly porous and have a high surface area, the nanoparticles also help to deliver more of the cancer-killing drug further into the cancer cells. WSU researchers used the gold and platinum nanoparticles to produce more ROS in the reaction, increasing the drug’s cancer killing efficiency. The gold-platinum nanoparticles, which are about hundred thousand times thinner than a human hair, also are efficient at converting laser radiation into heat and killing the cancer cell, making them promising for another cancer treatment known as photo-thermal therapy. The nanoparticle system could potentially be used as a dual mode system for both photodynamic and photothermal therapies, said Du. The new procedure, if approved for use, will mean fewer side effects for cancer patients, she said. The researchers are planning to file for a patent on their technique.